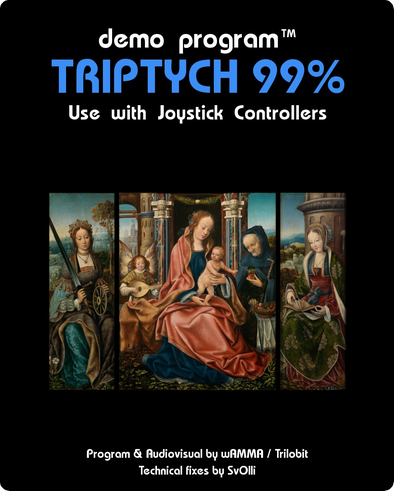 One day after the release of Scene Demos 6-in-1, visy contacted me and asked, if I could take a look at their attempt of a demo collection called "Triptych" to see if I could make it work. It was a bit more complicated, and most of the demos had to be patched a bit, to make sure they don't access any hotspot address for bankswitching. That and a non-deterministic starting bank where the problems that prevented the release of that compilation. The bank problem was fixed in hardware by using a more current ROM board. The part of patching the demos was just work I've done before. I came to a point where everything worked as expected, but I didn't consider it 100% because of the modifications on the original demos. For 100% I'd need a different approach: use a bankswitch scheme, which allows accessing the hotspots without running into trouble. This would only run on the Harmony/Melody Cartridge, but it would be even possible to do a 200% version: include all wAMMA/Trilobit demos released in just one cartridge. This would require an expanded Melody Cartridge. But the bigger problem here is that the menu would have to be rewritten completely. That turned out to be much effort, so the idea died silently over the years. The bankswitching code is done, though. It is not used for this version due to size constrains of the microcontroller used in the Melody board. It's not used, because it needs about 400 bytes of cartridge ROM in the bank of the menu code, which isn't available without rewriting some code. At the end of 2017, visy gave his okay to release the working "minimal version" (using just the classic F4 bankswitching and patched code, which I considered the "99% version") in the context of the Gravedigger compo on the Nordlicht 2018 demo party together with a release of a physical cartridge. All 12 were sold out in less than 24 hours. You can press fire to skip directly into the menu. In the menu press up and down to select the demo and fire to start it. To run another demo, you'll have to turn the system off and on again.